There are a lot of ingredients that have great anti-aging benefits, but retinol has been proven to be one of the most effective. The powerful vitamin A derivative works to effectively promote skin cell turnover to exfoliate and stimulate collagen production. Long term use of retinol can also help to reduce dark spots, pimples, and wrinkles as well as diminish dullness and uneven texture. As great as it is, retinol can be irritating, causing dryness, peeling and sensitivity to the sun. That's where bakuchiol, a natural retinol alternative comes in. I was recently selected by Influenster to try the Ole Henriksen Glow Cycle Retin-Alt Power Serum which features this buzzy ingredient. Ole Henriksen Glow Cycle Retin-Alt Power Serum is billed as all-in-one skin-perfecting day serum that works to target fine lines, wrinkles, pores, and dark spots, while instantly brightening. The star ingredient is bakuchiol. Pronounced ba-koo-heel, bakuchiol is derived from the leaves and seeds of the babchi plant, a mainstay of Ayurvedic medicine that has been used to to help heal, calm and soothe the skin due to its anti-inflammatory and antibacterial properties. Bakuchiol actively stimulates the skin cell regeneration process associated with retinol. In studies, bakuchiol has been shown to be as effective as retinol in activating the genes that regulate collagen and elastin production to diminish fine lines, wrinkles and uneven skin tone without the sensitivity, irritation or dryness. It's also worth noting that Bakuchiol is vegan as some forms of retinols are derived from animal products. This serum also contains alpha hydroxy acids that dissolve dead skin cells and trigger the skin’s reparative process. 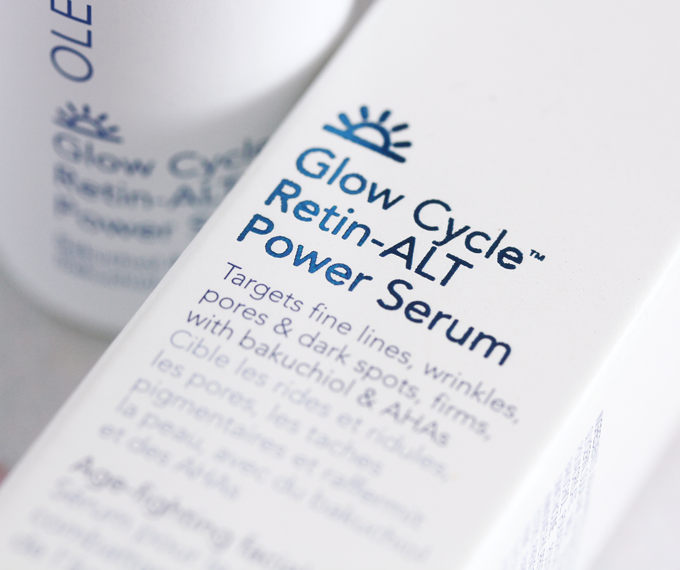 Unlike traditional retinol products, Ole Henriksen Glow Cycle Retin-Alt Power Serum can be used daily in the day and evening. Bakuchiol can actually help skin be less sensitive to the sun’s rays. But because this product contains AHAs, use of SPF is recommended during the day. You should already be using it anyway. This product does not contain parabens, sulfates, or phthalates and is suitable for normal, oily, combination and dry skin types. Bakuchiol: Derived from the Ayurvedic babchi plant, bakuchiol is a natural alternative to retinol that works to help even skin tone, smooth texture, as well as target fine lines and wrinkle. Edelweiss Stem Cell: Promotes firmness while improving the look of fine lines and wrinkles. AHAs (Glycolic and Lactic Acids) and Hibiscus Flower Extract: Gently retexturize to even skin tone and smooth texture. Red Algae and Tara Extracts: Promote firmness. Lemon, Sugarcane, Sandalwood, Licorice Root, and Chamomile Extracts: Work to condition and soften skin. 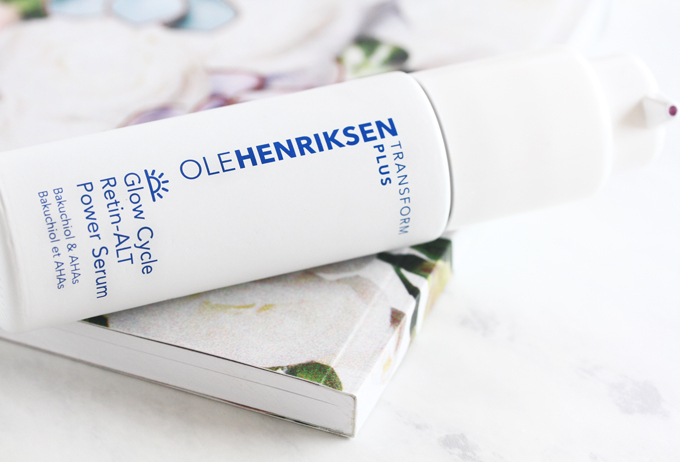 Ole Henriksen’s Glow Cycle Retin-Alt Power Serum is packaged in a substantial, opaque white glass bottle with a lockable pump dispenser that can be opened up. After cleansing, apply evenly to face and neck. Gently massage in an upward, circular motion. Pearlescent violet in color, Ole Henriksen Glow Cycle Retin-Alt Power Serum has a creamy lightweight texture and a fairly aggressive floral scent. There is no added fragrance The unusual color comes from the delicate flowers of babchi plant and it's not just visually pleasing, it's functional in imparting a brightening glow to the skin. The serum sinks into the skin with a silky satin finish. 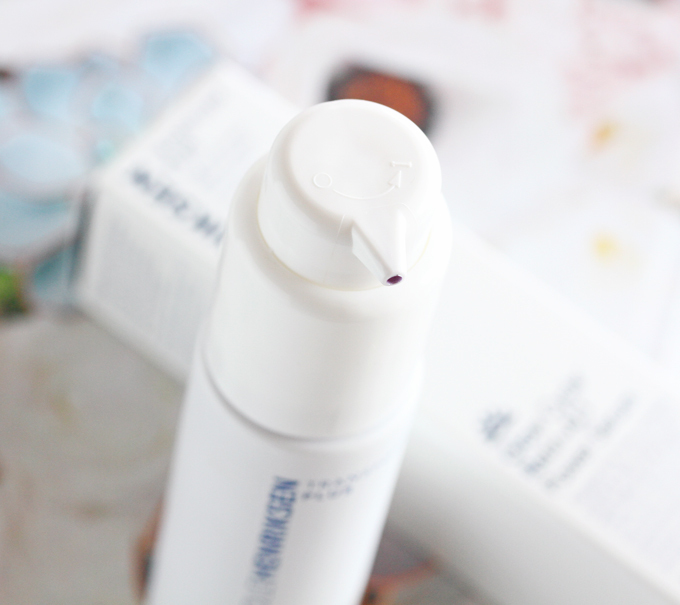 During testing, I only used this serum with a moisturizing cream on top. My skin looked good and I didn't experience any redness or dryness as I have with some retinol products in the past. At the same time I didn't notice any considerable difference in brightness or tone and it's been about two weeks. That's not to say there won't be any longterm results. I just haven't seen much so far. I do like that it hasn't caused any irritation and that it can be used during the daytime. I think I will have to reserve my definitive opinion following more continued use. This isn't my first experience with bakuchiol since I have tried the OSKIA Super 16 Serum which is superb. I saw some fairly quick and impressive results with the OSKIA product and it boasts a superior roster of ingredients. If given the choice, the OSKIA Super 16 would be my preference. This product is significantly less expensive though. I do believe that bakuchiol is a viable alternative to retinol and I have a feeling we're soon going to be seeing many more skincare products made with this ingredient. 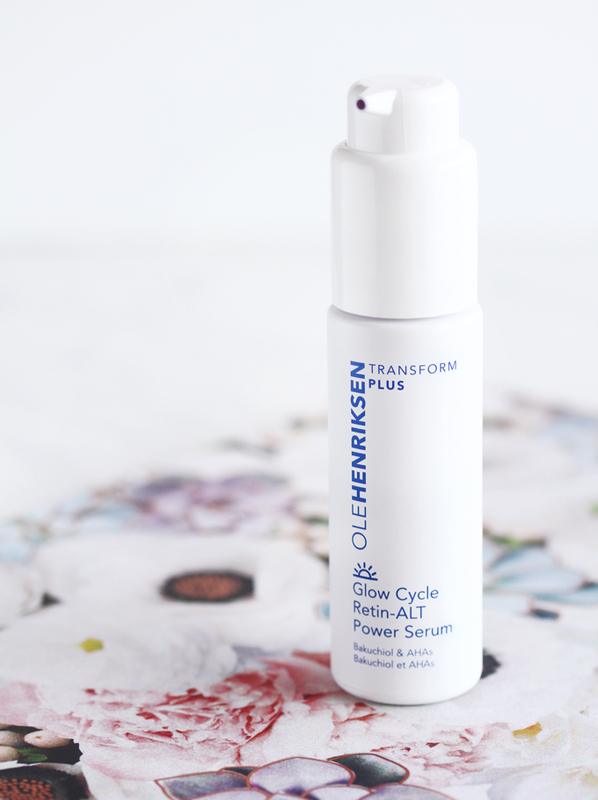 Ole Henriksen Glow Cycle Retin-Alt Power Serum ($58) is part of the brand's Transform Plus Retin-ALT duo which also includes the Goodnight Glow Retin-Alt Sleeping Créme ($55). Both of these products can be purchased at Sephora and Ole Henriksen. Have you tried any products from Ole Henriksen? I have tried a bit of Ole Henriksen in the past and did enjoy the brand, but I am not yet convinced by the ingredient being as effective as retinol. To be fair, I haven´t read the studies (I will put it on my to do list, but that is already way too long, so...), but these claims are easy to make and hard to proove. That doesn´t mean I dismiss the product though, the ingredient list sounds nice and even without a retinol-like substance should deliver results. I'm happy to hear this is suitable for all skin types as I'm dry-combination and find so many skincare products work against that! Also, WOW to your macro photography here of the swatch; incredible Rowena!! This sounds like an interesting serum and I like that it's geared towards different skin types! Thanks for sharing Rowena! I have not used any product from the Ole Henriksen brand before. It’s good to know that this Product has great benefits without the retinol ingredient. Thanks for sharing. I’ve got to know a lot about skin care products by reading your Reviews. I've been curious about this serum ever since I saw it on Instagram, mostly due to the purple color. But bakuchiol does sound like a promising ingredient, I remember seeing it in Oskia Super 16 and my skin loved that serum. Not sure if I'll give up using tretinoin completely though, but this definitely sounds like a gentler alternative. Thanks for sharing! I've never heard of this serum, but I have to say you did an excellent job with the pictures! Amazing! Thank you for introducing this serum! I have never heard of it or of Ole Henriksen before. I really like its purple color, looks kinda cool. I'm fascinated by the ingredient and the color. I actually should incorporate more retinol or Bakuchiol in my routine also. Anything to exfoliate and stimulate collagen! I never have any luck with Ole Henrikssen, I know many love the Vitamin C Truth Serum but it did nothing for my skin. I do have the Oskia serum in my list to buy but I can't stomach the price.